For anyone who isn’t familiar with the work you’re doing, what is the Rediscovery Centre all about? The Rediscovery Centre is a creative space connecting people, ideas and resources for sustainable living. As the National Centre for the Circular Economy, we bring together the skills and expertise of artists, scientists, designers and craftspeople united in a common purpose of sustainability. Located in a bespoke demonstration eco-facility, we support four reuse social enterprises; Rediscover Furniture, Rediscover Fashion, Rediscover Paint and Rediscover Cycling. These businesses use waste materials for new product development & design demonstrating effective resource efficiency, reuse and low carbon living. The Rediscovery Centre offers interactive and experiential workshops for all ages which cover wide ranging environmental and STEAM topics. The centre’s translational research activities support national waste prevention and climate action policy. We also offer a fantastic and unique event venue and meeting space. Does the centre have specific goals related to the UN SDG’s? The Rediscovery Centre aims at driving sustainable development in its own activities and supporting the implementation of the SDGs into national legislation. The most obvious SDG supported by our work is Goal 12 “Ensure sustainable consumption and production patterns”. Through our reuse enterprises and education, we showcase sustainable consumption and production and spread awareness about them. Our work also drives Goal 8 “Promote sustained, inclusive and sustainable economic growth, full and productive employment and decent work for all”: the four social enterprises of the RDC provide employment as well as community-based training in our Ecostore retail space and reuse social enterprises. These employment schemes support the local area and provide work experience and skills. Additionally, several other SDGs are relevant to our work, as we advocate for climate action, waste prevention (including food waste), and equitable and resilient societies. Why is having a Fairtrade cafe and being a Fairtrade Workplace important to you? In our own activities, we promote sustainable consumption and production to support the local community through training and employment. Therefore, the Rediscovery Centre also supports the sustainable production of the products we offer. As a social enterprise striving for sustainability, we are proud to be a Fairtrade Workplace and offer the best available products with a lasting positive impact. Having Fairtrade products in our café means we know they are produced in a socially conscious way and we can raise awareness about it with our customers. Ballymun may not come to everyone’s mind when they hear ‘new trendy sustainable centre’ can you tell us the history of the location and the community reaction to it now? The Boiler House that the Rediscovery Centre is located in was used to heat the Ballymun flat towers from the 1960 onwards. When the towers were demolished in the first decade of this millennium, the Boiler House itself lost its purpose and was meant to be demolished as well. 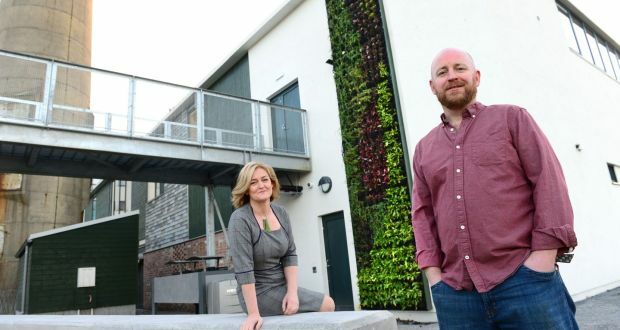 Here, the Rediscovery Centre team and Dublin City Council stepped in and in 2011, with the help of EU funding, managed to re-purpose the Boiler House into a best case example of building reuse and sustainable construction. The aim was to also provide a space for the Ballymun and wider community to connect, learn and create. Through our education department and our reuse workshops, we now teach and train locals about reuse and environmental topics, as well as STEAM subjects. Of course, the Centre’s café is a great place for the local community to meet and enjoy a Fairtrade beverage, etc (although unfortunately we are between cafe operators at the minute and are on the hunt for a suitable cafe operator). What do you think about the current Irish wake-up to sustainability with calls for reduced plastic in the shops and campuses committing to go plastic free? Do you think it’s a fad or a necessary wake-up call? How are your clothes produced? What happens to your old tins of paint at the recycling centre? And could that old cabinet look nice again with a lick of paint? We would like people to rediscover the value in the things they own and hope to inspire creative reuse. Raising awareness about the environmental impacts of plastic can therefore be a first step to more conscious and sustainable consumption. Find out more about the Rediscovery Centre here, and join them and many other leading Irish organizations who have become Fairtrade Workplaces.